Lucy and Christopher traveled from the United Kingdom to get married at the Hard Rock Hotel at Universal Studios in Orlando, Florida. Their quirky style fit hand in glove with the surroundings at the Hard Rock. 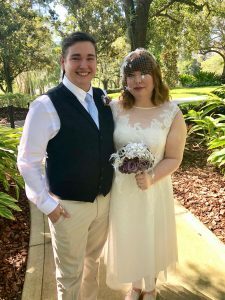 From Lucy’s broach entrusted bouquet with family heirlooms and a jeweled skull to Christopher’s matching boutonniere it perfectly fit their style. Victoria with Just Marry was the day of coordinator. Tabitha Oneill with Tabitha Photography captured everything from the moment the groom emerged from his room through to the couple’s first dance. The couple used Married by Mail to obtain their Florida Marriage license before they ever got to Orlando. Rev.Glynn Ferguson with Sensational Ceremonies worked with the couple to create a custom ceremony, just for the two of them. He gave them a homework assignment and asked them to write and say why they love each other. Lucy said: Christopher is my soul mate, my best friend and absolute love of my life. From the moment I first saw him, that adorable nerd sat swinging his legs waiting for our Buffy The Vampire Slayer club to start, I knew we were meant to be. We fit perfectly together, his hand in mine, my head on his shoulder, the terrible jokes that only we find funny. There is no one else I would rather have sat with me until the early hours laughing at a silly voice or crazy scenario than him. And no matter how tired I am in the morning, I wake up excited everyday because I get to spend it with him. We’ve been through a lot throughout this 11 years, and it has made us into such an amazing team. He is the kindest, loving and most beautiful person I have ever met, and I am so lucky I will get to call him my husband. * I will always laugh at his jokes, especially the terrible ones. * And I will love him forever, even after the stars turn cold. * It’s entirely possible that, without you, I’d actually be quiet. Now don’t let anyone tell you off for that, because it’s not your fault I’m so annoying, but I just can’t help myself. * I want to tell you about my day. I feel I need to help you out or brainstorm with you when you’re dealing with nonsense and gubbins (I promise, I do actually listen between all the blabbing I do myself). I have a near-constant urge to do stupid things and make terrible jokes because it’s all worth it if I can summon even one snort or giggle from you or see you flash one of your many gorgeous smiles. * You’re my best friend and my better half. I can’t wait for the next part of our adventures together. It’s entirely possible that, without you, I’d actually be quiet. Now don’t let anyone tell you off for that, because it’s not your fault I’m so annoying, but I just can’t help myself. I want to tell you about my day. I feel I need to help you out or brainstorm with you when you’re dealing with nonsense and gubbins (I promise, I do actually listen between all the blabbing I do myself). I have a near-constant urge to do stupid things and make terrible jokes because it’s all worth it if I can summon even one snort or giggle from you or see you flash one of your many gorgeous smiles. You’re my best friend and my better half. I can’t wait for the next part of our adventures together.